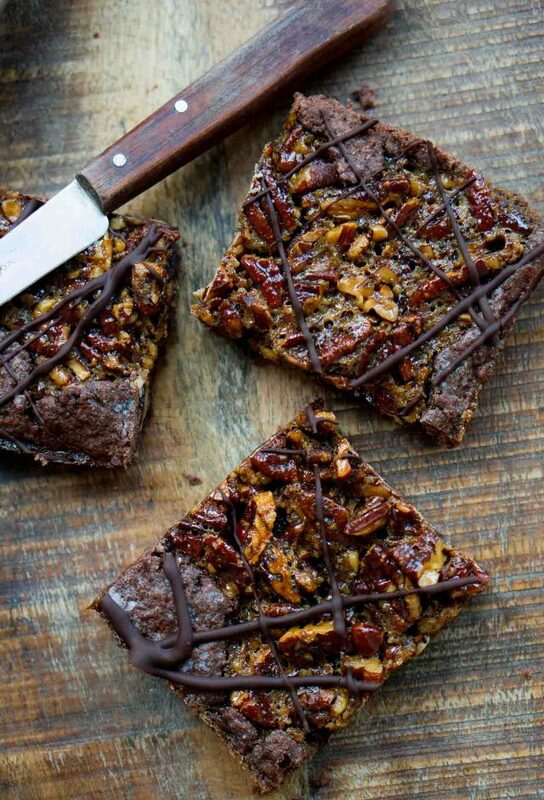 Pecans are the great American nut and at no time of the year are they more in demand than around the holidays. There are a lot of different nuts grown in the United States; walnuts, almonds, pistachios, and hazelnuts, but a pie made with toasted pecans is a holiday tradition and every year I have the urge to make one. Recently an American membership-only store opened in France, and while there are many French hypermarchés (mega-stores), this one caused a splash, particularly amongst Americans, because they have things like big rolls of their famous plastic wrap with that superlative cutter, IPA beers, and from what I hear, big bags of pecans. There’s always been Metro, a similar mega-store that carries more restaurant-supply items. But there’s a huge refrigerator filled with every kind of French cheese (and butter) that you can imagine, sold whole (like an entire wheel of Brie) or butter in large blocks, and they give you down jackets to wear because you want to spend so much time in there. It really is that cold. But you need to be a professional to go there. So when I do use them, I made sure they’re going into something that’s going to be a sure-fire hit. I got a copy of Pie Squared from Cathy Barrow, who’s very adept at baking. And this one was a winner. The one thing that you will need is a quarter sheet pan. She and I must’ve been on the same page because a few months back, I suggested everyone get one since I’m enamored of mine. Speaking of hacking, the rich chocolate dough was a little sticky to roll out. Cathy recommended rolling it in a good amount of powdered sugar. Unfortunately, my kitchen counter started looking like a blow bust, so I pulled out two large sheets of parchment paper and rolled the dough between them, which worked great. I still haven’t mastered the art of taking pictures of myself doing things like rolling out dough, digging my hands in flour, or scribbling tarts and pies with chocolate (when I try to do it on Instagram stores, it never ends well for me…or my iPhone) but the final results were greatly enjoyed. Adapted from Pie Squared: Irresistibly Easy Sweet & Savory Slab Pies by Cathy BarrowCathy recommends baking this slab pie on a pizza steel, which I happen to have, and they work great. If not, you can use a pizza stone or over an inverted baking sheet, to evenly distribute the heat. She wrote a whole book on slab pies, and I figured extensive testing revealed those to be the best workarounds.She also makes her dough in the food processor, freezing the cubes of butter first. 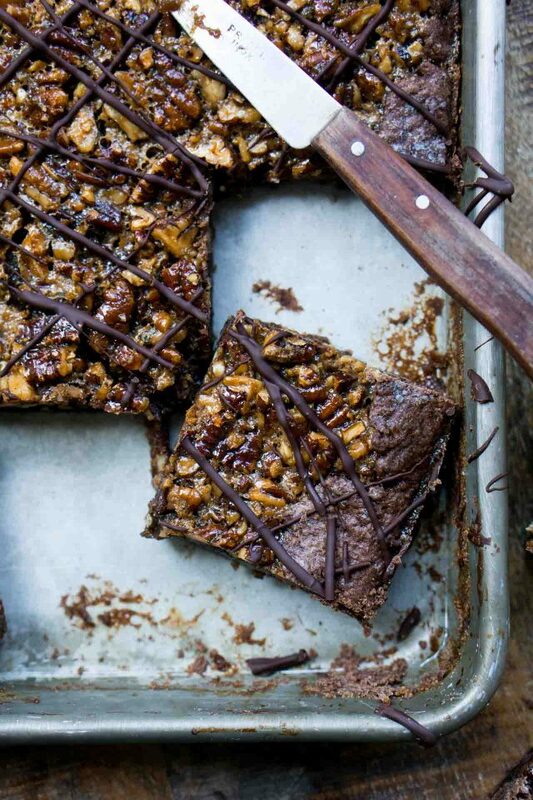 If you want to go that route, you can.Speaking of the dough, the recipe uses natural unsweetened cocoa powder, which in the U.S., is what you find in the supermarket, such as Hershey's. You can also find natural cocoa powder made by bean-to-bar companies like Guittard, Askinoise, and others. I asked her about using Dutch-process cocoa powder, which is what's usually available outside the U.S. (and, of course, it's available within) and she said it made the dough gummy and difficult to deal with. We didn't hash out why, but since she told me she tested it to death and it didn't work for her, I recommend only using natural cocoa powder. (If you try it with Dutch-process cocoa powder, let me know your results in the comments. UPDATE: A reader made the dough with Dutch-process cocoa powder and said in the comments below this post that it worked just fine. )For more on cocoa powder, check my post, Cocoa Powder FAQs. If you want to skip the chocolate crust, you can use a favorite pie crust recipe or even a store-bought one, if you're so inclined.For information on tracking down ingredients in France, like brown sugar, molasses, maple syrup, and more, check my post, American Baking in Paris. 3. Roll the dough by placing the rectangle of dough between two large sheets of parchment paper, until the dough is a 11- by 15-inch (28 by 38cm) rectangle. Carefully peel the top piece of paper off of the dough (if it's difficult, it may help to chill the dough on a baking sheet), and overturn the dough onto a quarter baking sheet. Remove the other piece of parchment paper and use your fingers to coax the dough into the pan, gently making sure it's well-fitted into the corners and the sides, leaving any excess dough overhanging the sides. Refrigerate the pan with the dough in it. 1. Preheat the oven to 350ºF (180ºC). If you have a baking steel or stone, put it on the middle rack of the oven. Otherwise invert a rimmed baking sheet, if you have one, on the rack to even out the heat. If you don't have any of those, it's okay to bake the pie without it.Melt the 6 tablespoons of butter in a saucepan over medium heat until it starts to foam. Add the brown sugar, corn syrup (or another liquid sweetener), and maple syrup and stir until smooth. Remove from heat and let cool until tepid, about 5 minutes. 2. Whisk in the the bourbon (if using), salt, and vanilla. Then whisk in the eggs one by one, until they're completely incorporated. Stir in the chopped pecans. 3. Scrape the pecan filling into the prepared pie shell, fold the overhang of dough over the pecan filling, and bake on the prepared middle rack of the oven until the center feels almost set in the center. Mine took 30 minutes, although in her book, Cathy says it'll take 55 minutes, so start checking it at the 30 minute mark. 4. Remove the pecan pie from the oven and let cool completely. Serving: Serve the pie on its own, or with whipped cream, vanilla ice cream, or cinnamon ice cream. Storage: The pie can be made 3 or 4 days in advance, and kept at room temperature or refrigerated. I love this slab pie and will be making it soon. Costco here in Santa Cruz has some fantastic cheeses and nuts, especially pecans. Missing last step of melting the 2 oz. of chocolate and drizzling over the cooled slab? Yes, I just noticed this, too. 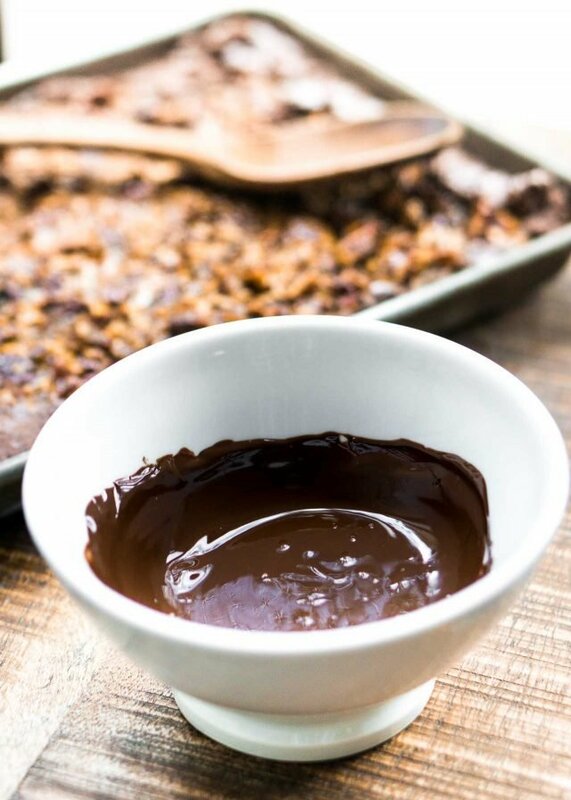 Do you drizzle the chocolate after removing from the oven or while the pie is still baking in the oven? Dang it. Just did my shopping for Thanksgiving yesterday… Oh well, I’m sure I can find an excuse to make this anyway. Happy Holidays! I just checked amazon UK for the plastic wrap. Prices between 45 and 100 POUNDS! Waaaaay cheaper to buy on the US site and pay for shipping! David, can I double the amount of molasses instead of using maple syrup? Is it only a question of taste or does it change the consistency at the end? Maple is awfully expensive here in Brazil. Thank you. You could but molasses is pretty strong, but if you like that flavor, you can use it instead. You could also use mild-tasting honey for the maple syrup. 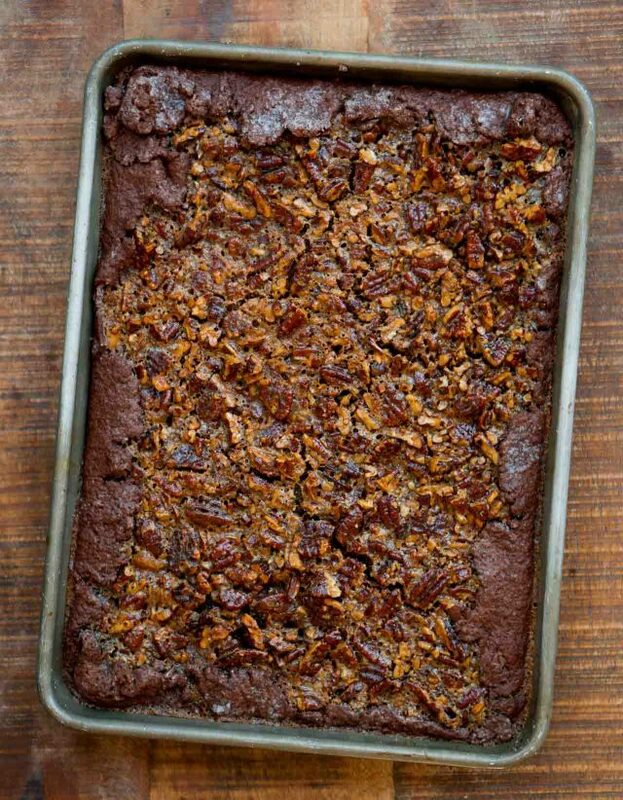 This sounds so good & I plan to make it for Thanksgiving…however I can’t find a baking temperature anywhere? Please advise F temp for an American one, Thankyou so much! Wow. 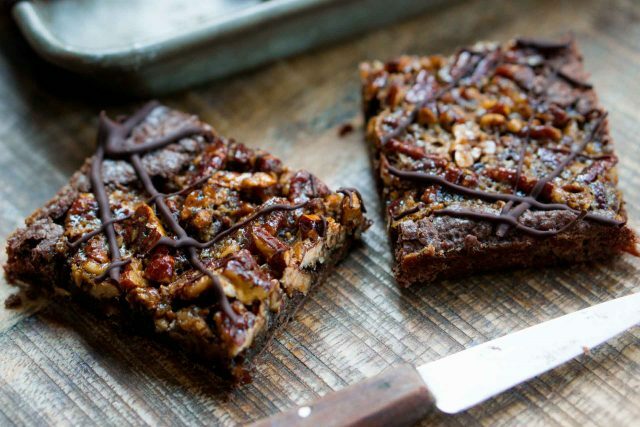 I make the pecan bars in the Silver Palate cookbook all the time and they’re a HUGE hit (though, being far from Paris and not wanting to take out a second mortgage to pay for pecans, I substitute walnuts). But a CHOCOLATE crust? That would have folks fainting. Thanks for this recipe! 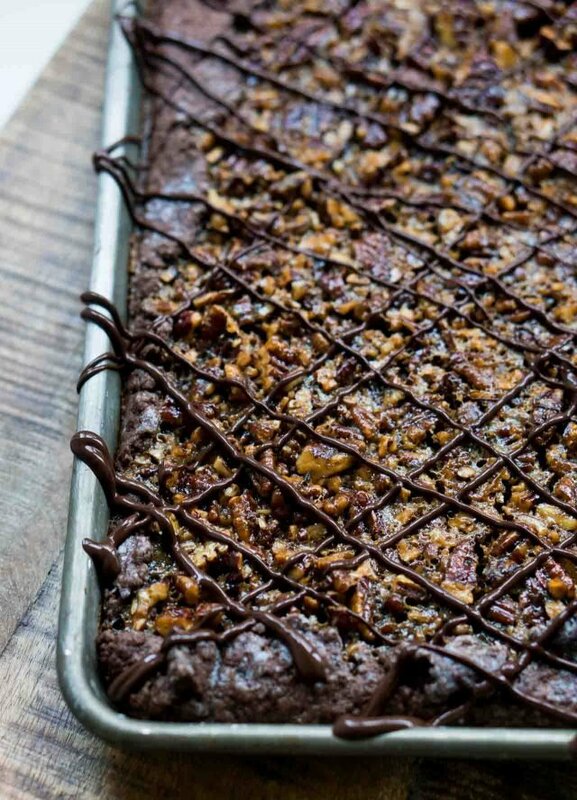 It’s easier to crumble the dough over the sheet pan and press it in. I have a small (1 1/2 inch) rolling pin that makes this easy, but you could also use a smooth-bottom meat pounder or small jar to avid using your warm hands. Yessss! Definitely doing this next time. David – thanks for this recipe. Heading to France for the Thanksgiving week, wanting to bring along some cranberries. Wondering if I can keep them in a carry on, thought you might have experience. Now I will definitely bring along pecans even though we are headed to walnut country. Every year I make your chocolate pecan pie for Thanksgiving. Is this one worth replacing that this year? Joan: You could perhaps (if you try it, let us know if it works with this dough), although you wouldn’t get the overhang which is nice to have to fold over and contain the filling. Mary Jo: You may want to check if fresh produce is allowed in, which could vary depending on what country you’re flying in from. David, is this a “make ahead”? Will it keep well for a few days or in the refrig? David, you call this a ‘slab pie’? In the directions you call it a tart. 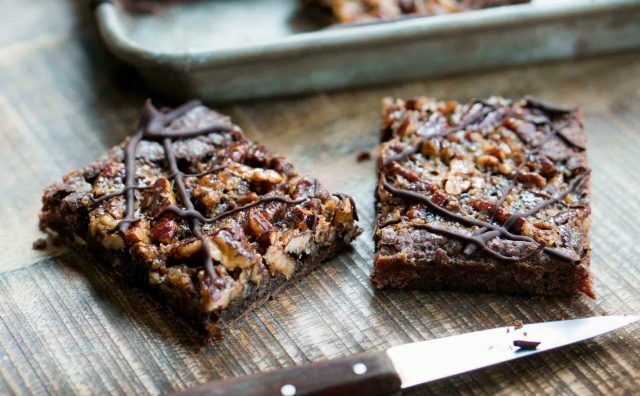 Do you have an aversion from calling a bar cookie a bar cookie? Mesdames et Messieurs I give to you Les Chippy Dippy Slab Pies! I wasn’t really thinking about that. I was trying to share a recipe from a terrific new book, and give readers a recipe they might want to make during the holidays. It takes me 3-4 days to put together a post, with taking pics, writing something up, and formatting the recipe, so it’s hard to keep track of the nomenclature. So while Cathy, whose recipe I adapted, calls it a pie, it could be called a tart as well. Apologies for any oversights or confusion. A classic case of “nit-picking”! Two questions, can I make this ahead and store it on counter? Also, in the beginning you suggest a quarter sheet pan and then there is discussion of a pizza stone or inverted pan. Is it fine in the quarter sheet? Maybe I am just not reading carefully but I am putting on my thanksgiving dessert and I can’t take a chance it needs to work! You could definitely keep it a few days at room temperature. I did. I am sure it could be chilled or frozen as well, although I didn’t do either. I added the instructions for a baking steel or stone (I used a steel) but I don’t know if it’s absolutely necessary. I didn’t test it without (or without an inverted baking sheet, as Cathy advised) but if you do, let us know how it works out in the comments. David, This sounds divine. I think you mean we should place the quarter sheet pan ON the pizza stone or inverted half sheet pan in the oven. Correct? Whatver you want to call it is fine. How about utterly obscenely delicious? It almost seems like a bar and as a slab pie, what about using something else, like said tart pan or even a somewhat larger pie plate? My, my, you must be tired with all the cross-Atlantic travel. Say hello to Romain for me! Bake this on parchment or straight on the pan, buttered and floured? We visited Costco in UK and found the prices similar to the higher quality food stores. No bargains in our estimation. We live in Vancouver and have great prices. There’s a chain of stores called Metro that are for professionals only (I think it’s a German company but they are widespread in France). You need to have a food-related business to get a card, unlike Costco, where anyone can join. Even though I generally have a rule about not eating anything with the word “slab” in it, this definitely looks like something I would try. It sounds delicious. Do I need to prepare the sheet pan in some way to keep it from sticking, or does it come out clean? I’m left wondering what’s the difference between a “chocolate slab pie” and a “giant brownie”? Ha, totally get the thing about bringing home the pecans! My reasoning is that given that Valrhona feves are way cheaper in the US than here in New Zealand, it makes perfect sense to fly 10,000 km to LA and pick them up at Surfas. Bargain! I tried to find this information in your FAQs (apologies if I missed it). In my experience, the weight of a large egg varies from one country to another (e.g., an US large is a UK medium egg). May I know what is the average weight of your large egg without its shell? I also own a copy of your Sweet Life in Paris. Are the weight of the large eggs used in this book same as the large eggs used in this blog? I don’t bake with eggs by weight because it’s too fussy for home cooks wanting to make a cake or tart, which usually just call for 1-4 eggs. Unless you have a bakery and are doing large-scale baking, a teaspoon or few grams more of egg in a recipe shouldn’t make a noticeable difference. There’s a good article in Fine Cooking, Does Egg Size Matter? that lists weights, yields, and more. The eggs I use are large eggs, and correspond to what’s mentioned in that article. I’m wondering about the pan. A 1/4 sheet pan seems very close to the common 9x13x2in baking pan, but the sides are shorter, being only 1 inch tall. Do you think the extra pan height would affect the results with this pie? What temperature is the oven set???? 350ºF/180ºC. It’s listed in the first step of the second part of the recipe, right when you begin to make the filling. I made this yesterday, and it was simply delicious! It had much more depth of flavor than the Derby Pie I traditionally make this time of year, and although it was more time consuming, it was totally worth it. I had trouble rolling the dough between parchment paper. I couldn’t get it large enough to fit in my quarter sheet pan that I bought when you recommended it, David! I took the advice of an earlier commenter and pressed it into the pan and up the sides to make a lip for the filling. I placed the pan directly on the oven rack, and it was done in 30 minutes. Thanks so much for this fabulous recipe, David! Great feed back! I’m making this now with your insights. 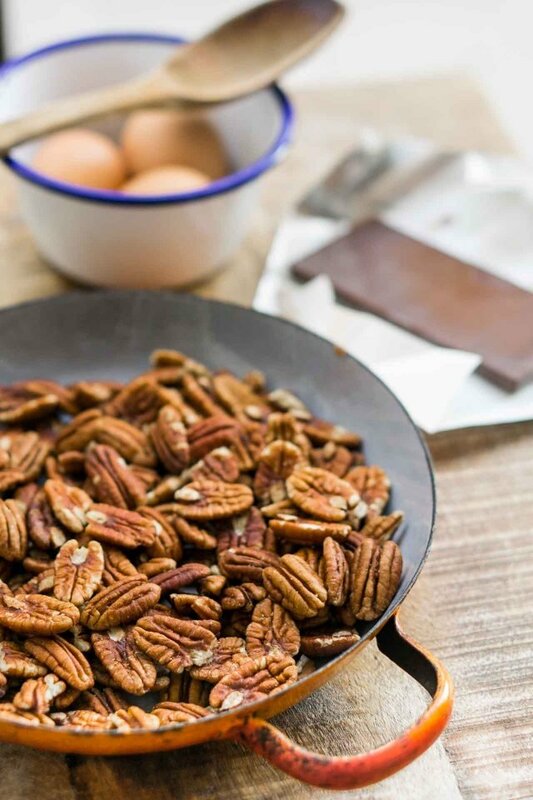 My first recipe when I get a big American bag of pecans is always the holiday mix from Sweet Life in Paris – my entire family scarfs that by the handful! I doubled this in a half pan for visiting Thanksgiving folks and it turned out great. 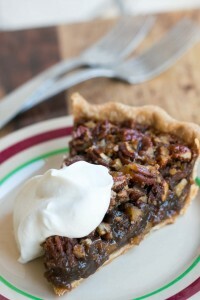 That molasses/maple/brown sugar combo is so much better than the typical pecan pie, at least as I’ve had it. I’m not sure I’d spend the time on the cocoa crust again vs a regular pie crust, as it was sticky and difficult to handle. I ended up with an uneven bottom and some filling that leaked under. But I’m not much of a pro and was pleased to pull it off at all! 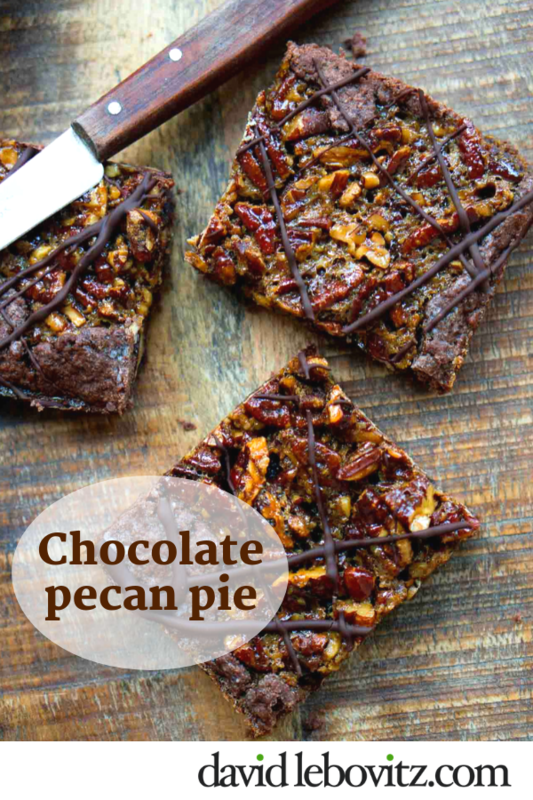 Oh dear, I had enough trouble deciding between your chocolate pecan pie and the bourbon ginger pecan pie already on your blog now I have a third one to choose from! Which would say is your favorite of the three? Ohh made this over the weekend and it was a total hit! So rich! I made lightly sweetened whipped cream and I think that really help cut the richness- mine also cooked in 30 minutes on a pizza stone. I used Dutch – process cocoa and it was absolutely fine, not gummy, pretty easy to handle. I doubled the crust and rolled a half sheet after chilling the dough for an hour. I just used a little dusting flour, kept the dough moving under my pin, did not use the parchment trick at all. I haven’t filled and baked it yet, just beginning my Thur prep…I like that the sweetness of the dough is minimal but it has a good flavor. Thanks! Thanks for letting me know. I didn’t think there would be much of a difference but Cathy said she had problems with Dutch-process cocoa powder. Appreciate your feedback! Hi, sorry to nitpick, but I have a question about the conversions for the maple syrup and golden syrup. One cup = approximately 250 ml (different in US and UK, but this conversion works pretty well), so 1/4 cup is approximately 60 ml and 1/3 cup is approximately 80 ml. If 1/4 cup equalled 80 ml, that would make a cup at 320 ml! I’m about to try this recipe, so which should I go for? Thanks! I use the conversion of 1 cup syrup = 320 grams. I switched the recipe so it reflects that. (The difference isn’t enough to make a big change in the outcome of the recipe. This one isn’t very fussy.) In the new year, I am probably going to switch the recipes on the blog to only one system of measurement to make things easier for me and my readers. I may take a poll to find out which is preferred by readers. don’t know if you are still in New York or when you’ll be back, but wanted to pass along that you should check out Runner and Stone in Gowanus area. Really amazing bread (the croissant are even good if you take them home to have the next day) and an amazing rye brownie sundae on the dinner menu. I can’t wait to try this. It’s really nice to read other cooks’ responses here, especially when they’ve made the recipe! I’m always happy to receive your blogs in my inbox. As I am a foodie and home cook, I always find some inspiration – not to mention a few chuckles – and sometimes even fall asleep at night with that page open, thinking about making your delicious recipe the following day. There are lots of things to keep us awake at night these days, and I try to focus on happier ones. So sometimes I think about earth-friendly alternatives to conveniences in our lives that we take for granted (like, yes – plastic). I am a Costco customer, I admit, and I love finding deals that let us enjoy the finer things in life. I am dismayed, however, in the degree to which Costco uses plastic in its packaging. I think it would be pretty much impossible to attempt to be “zero-waste”, and shop at Costco! Anyway, even though I’m nowhere near “zero-waste”, I do try to stay conscious about the proliferation of plastic waste in my world, and attempt to reduce it. This brings me to the point of my email. There are some really nifty products that are being made right now to replace plastic food wrap. I have a few silicone covers which serve as lids in both the fridge and the microwave. And we also have some of that beeswax-imbued muslin, which also works for non-container type situations. If I’m taking a dish over to friends’ or a potluck or whatever –a piece of parchment placed over the top of the bowl (rubber-banded if necessary), within a recycled plastic grocery bag, if the other things are not the right size. I think it’s worth pausing a moment before stocking up on plastic wrap, and see if we can change direction. I’m baking it as I type this, after cleaning up. FYI, your print version instructions leave out key things like the temperature and the last paragraph about melting the chocolate and drizzling it doesn’t print. I baked it in a 9×13” Pyrex glass pan as I don’t have anything else similar. I’ll post a photo on Instagram and FB so you can see my finished pie. I came back here to find these missing bits. Hi Sandra: Those steps are in the recipe. In step #1 (part 2, under “To make the pecan filling”), the temperature is there; it’s 350ºF. The step for melting the chocolate is step #5. If you can’t see them, you may need to refresh your browser or the web page. 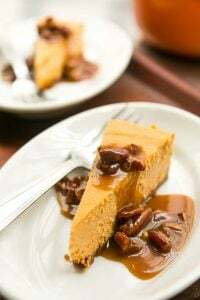 Planning to make this for Thanksgiving – can I make it on Wednesday (think I can based on the recipe) – do I need to refrigerate, or leave at room temp? Cut in squares when cool? or leave in the pan until Thanksgiving? Can’t wait to make it – looks amazing!! Yes, at the end of the recipe, I note that it can be made a few days in advance and left at room temperature. You could refrigerate it at well. I would store it whole, rather than cut into squares. This pie is best cut when it’s at room temperature, rather than warm. Happy holidays! The chocolate layer is really thin – hope it all works! Would this work doubling the recipe for a half sheet pan? I need to feed a crowd. Thanks! I’ve not tried it so can’t say. Theoretically it should work but you want to make sure it gets done in the center without overcooking around the edges, so you may want to lower the temperature. I also think I’d divide the dough in two and roll them separately, patching them together in the pan. If you do experiment with doubling the recipe, let us know how it works out here in the comments! Thank you for this delicious hybrid pie-bar. 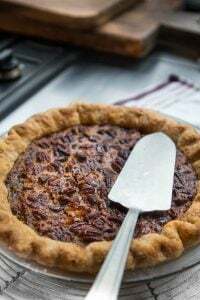 Over the past couple of Thanksgivings, I’d tried to adapt a pecan pie recipe to a bar form, without success, and I was pondering how to proceed this year. I found my answer here. For our two-person household, I made a half-recipe, using the 6 x 10″ tray from our toaster oven. I rolled out the dough without a problem between a sheet of plastic wrap (the piece I’d wrapped the dough in for refrigerating) and a sheet of parchment paper, using the plastic-wrap side to flip the dough onto the tray. Baking time was 25 minutes. Rather than making the drizzle, I sprinkled the chocolate bits over the top and let them melt into small pools. Excellent with vanilla ice-cream. Rather than putting chocolate into a pastry bag, I just spoon-drizzled it onto the pie. Easier and I think it suited the rustic look of the pie. Can’t wait to taste it. Happy Thanksgiving, fellow Yanks! Gooey. Should it have been firmer? When cut, it did not have really crisp edges. Would walnuts work ok in this? I live in Morocco with no access to pecans. Also not enough space in my countertop oven for a quarter sheet pan. LOL!